“I surrender all”, “l eave it at the foot of the cross”, “let go, and let God.” Raise your hand if you have ever heard of these phrases, said any of them or more importantly have attempted any of these. I think I see a lot of hands! Here is another question. How many of you have actually successfully executed any of these in your life at any given point? I am sure that there are some of you who have but as for myself I have to admit that it is one thing to say it and entirely another to do it! But it is possible! I had the awesome opportunity to experience this at one point in the past, and it occurred when I was at the end of my rope. Another familiar phrase, we have all heard it and been there. According to the Urban Dictionary the phrase means “to be out of options or alternative courses of action; to be stuck in a bad situation.” A ‘rope’ is thrown to someone who is in a difficult place, such as deep water or the edge of a cliff. If there is not enough rope, the person might be in trouble. 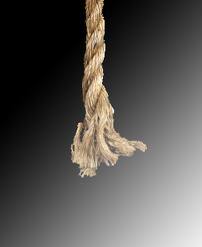 So to be ‘at the end of your rope’ means that there is no more help available, and the situation is not good. You would think it would be an easy moment for us? For us as Believers to realize that our only option is to to surrender, turn to Jesus and trust Him. BUT we don’t do we? We try to fix things, we worry, we pray, but it can be an eternity from “surrender” to peace and rest. It seems to me that surrender is much like submission. And quite frankly, the reason we don’t fully surrender is tied to our sinful nature. When we fail to fully surrender we are being motivated by things that are contrary to the Spirit. Control: Trying to make the situation or issue confirm to my wants and desires. We may not even fully realize these heart motivations are being played out in our circumstance or situation. But they are real and will not only delay our inner conflict but in some cases will make our issue much worse. A lesson from Mary and Martha. Now your situation may seem or be much greater than Martha’s dilemma but the principle is the same. Martha was likely frustrated, upset and wanted Mary help her. There was likely pride, worry, and control at play here. But what was Jesus answer in that situation? We need to draw near the Lord, surrender, and trust Him. This entry was tagged At the end of your rope, Control, Jesus, Mary and Martha, Pride, Surrender, Worry. Bookmark the permalink. This is so good, Michael! Thank you so much for the encouragement!